This Halloween, if you want a look that stuns and scares, go for bloody vampire makeup. Achieving this look is very simple. The basis of this look, as detailed below, consists of foundation, bloody lips, and decorated eyes. Blend some of your regular liquid foundation with the creamy white paint on a pallet. The color you should achieve will be a pallid version of your natural skin-tone causing your face to appear lifeless with no blood-circulation. Apply this color to your entire face (with caution around your eyes) and exposed neck. Then contour under the cheekbones with a deepening brown shade. This will enhance the sallow appearance that most vampires have. When it comes to vampire eye makeup, you can be as creative as you like. You can simply apply dark, contouring colors or spice it up with some reds, purples, blacks, glitter, and false lashes. The choice is yours here. Have fun with it! Begin by mixing together your warm water and corn starch (or flour). The starch will ensure a thicker consistency in your fake blood, making it all the more realistic. After you've blended the two together and eliminated any clumps, add the corn syrup and mix well. Once the paste is smoothly blended, gradually add your red food coloring, spoon by spoon until you have reached the desired level of redness. Generally, a brighter red will produce the outstanding effect you're trying to achieve. Finally, add the powdered cocoa if you like, to give a slightly brown tinge to the blood (as real blood carries a brownish-red quality). Keep some fake blood in a disposable vile with a mini compact paint brush for the day, so that you may easily reapply as needed. Apply any red lip stain to the center of your mouth, dabbing it with your fingertip. If you'd like, you can even use a black color to embellish the gothic vampire look. Now that you have some readily available fake blood, purchased or homemade, you can complete your easy-to-achieve bloody vampire makeup. Using a simple fine-tipped synthetic fiber brush (this could even come out of a child's watercolor set) dabble the fake blood in a downward motion from the corners of your blood-stained mouth. Simply paint on the bloody lines and leave a few heavier droplets at the end of your bright blood trails to achieve the appearance of a vampire who just feasted on an unsuspecting mortal. When it comes to Halloween makeup, you can be unabashedly inventive. Feel free to add more blood to your guise, place bite marks on your neck and wrist, or create a personalized glamorous appearance fusing your own unique style into the vampire makeup. 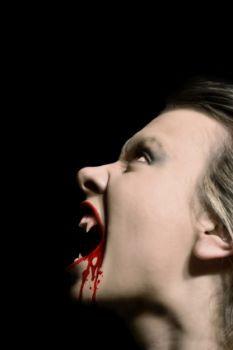 Wear cosmetic vampire fangs and unnaturally vibrant colored contact lenses. Whatever you choose, enjoy the process. After all, that's what Halloween makeup is about!